One of the school events that started my week was being invited to the Edgerton Elementary first grade classrooms to speak about leadership and my role as a superintendent. Beyond the "What does a superintendent do?" and "How old are you?" questions was the very last question asked of me: "What inspired you to be a superintendent?" 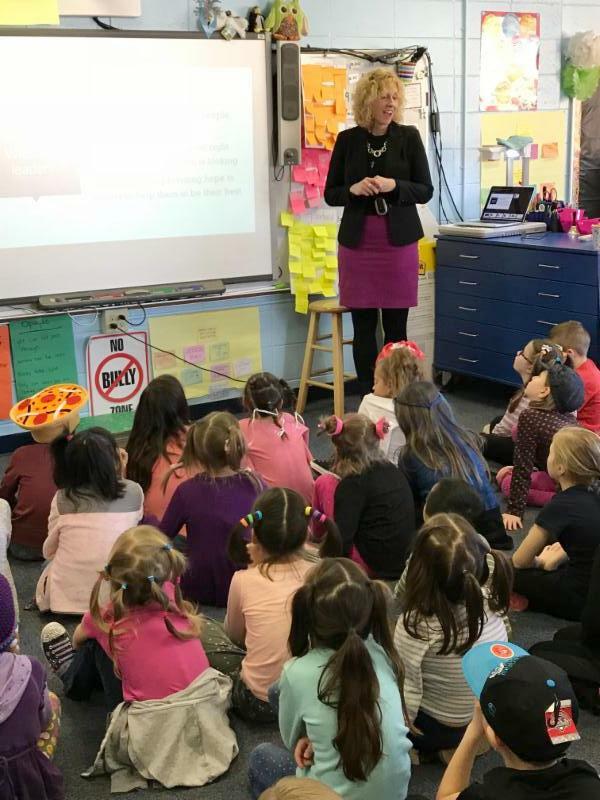 And, while I shared my response with the first graders, I wished I could have given them all the reasons, the reasons before I become a superintendent and the ones I have every day. The inspiration I see in the hallways, the playground, the athletic fields, the community. The conversations and the moments without words. And, especially, the first graders who asked me "What inspired you to be a superintendent." Good luck to our WHS cheer team at state this weekend! And good luck to our WHS DECA team as they head to state! The Hales Corners Health Department is working with the Greendale Health Department on a combined community effort, Community Alliance: Awareness and Prevention of Substance Misuse , to provide education/promote awareness of substance abuse issues and prevention strategies in both communities. The first educational event organized by Community Alliance is on March 28, 2018 at Greendale High School. It’s entitled “Community Wellness and Substance Abuse Prevention.” The flyer is attached. Board briefs are simple summaries of our board meetings. Without having to labor through or wait for the comprehensive board minutes, you can access what changes the board approved at each of their meetings! The latest board brief (for the February 26 meeting) has been posted. Check it out on the right sidebar of our Agendas & Minutes page. Check out the summer program for the Village of Hales Corners Recreation Department! As school safety has moved to the forefront of our concerns and conversations, we have decided to introduce this recurring Connect item that offers safety tips for parents each week. These tips are courtesy of the Greenfield Police Department. Talk with your child about the violence he or she sees on television, in video games, and possibly in the neighborhood. Help your child understand the consequences of violence. The 2018-19 school calendar was approved by the board in December and has been available on our website. Click here to view the calendar. Since we are unable to start school prior to September 1 (which falls on a Saturday), our first day of school for all students is on Tuesday, September 4. We recognize the need for a day for those students transitioning to a new building to alleviate any anxiety they may have and allow the opportunity for them to acclimate to a new building, staff, and routine. The calendar has Wednesday, August 29 as a transition day for K4, K5, grade 6, and grade 9 students. The transition day will be a full day for students in these grades and will be run through summer school as we cannot count it as a school day prior to September 1. Transportation and lunch will be provided for K5, grade 6, and grade 9 students. While it is not required for students, we are strongly encouraging students in these grades to attend. More information and registration will be available in the next couple weeks. On Tuesday, juniors took the ACT. On Wednesday, they took the Work Keys Assessment. Great job! As you know, dismissal is a busy time of day at Edgerton. We’d like to thank you for following our procedures, which have been implemented to keep students safe and the process running smoothly. If you pick up your child in the car pick up line after school, please follow the traffic signs. There is no left turn from Edgerton Ave. into the parking lot from 3:15 - 3:45 PM. Also, please be careful not to block the mailboxes on the south side of Edgerton Ave. so that the postal service can deliver the mail. Students picked up in the car line should be able to enter the passenger side of their vehicle unassisted. If your child requires assistance, it would be helpful if you park your vehicle and meet your child on the playground. Thanks for helping to keep everyone safe! Edgerton Elementary will be hosting a book swap in June. If you have any gently used children’s books your family is no longer reading, please consider donating them to the book swap. With enough donations, every child at EES will take home new and exciting books for their summer reading! Donations may be dropped off at the Edgerton office during regular school hours. Bring your blankets, wear your pajamas, and settle in for Edgerton PTO’s movie night on Friday, March 9. Disney’s Coco will be the featured movie. Doors will open at 6:15 PM, and the movie will begin at 6:45 PM. Look for more information coming home in your child’s take home folder. The next scheduled box top prize drawing is Friday, March 9. Keep clipping and sending those box tops to school! Please join us for the next PTO meeting on Thursday, March 8 at 7 PM in the Edgerton library. Our spring parent-teacher conferences are teacher or parent requested. It is important to return the conference planning sheet. After the planning sheet is returned, teachers will be sending out their Sign Up Genius. This should arrive next week. Feel free to join the Dr. Seuss birthday celebration at the Hales Corners Library tonight at 6:30 PM. This event is co-sponsored by the Friends of the Library and the Whitnall School District. Our Read Across America Spirit Week was not only fun, but provided time to reinforce the joy of reading. What good books have you read lately? As March weather can be ever changing, please remember that we will send students outside for recess in the gear that they came with at the start of the day. If the temperature rises above 50 degrees, we will permit them to take off layers so that they don’t overheat while playing. Whitnall Youth Baseball & Fastpitch is hosting additional registration dates. Follow this LINK for information.